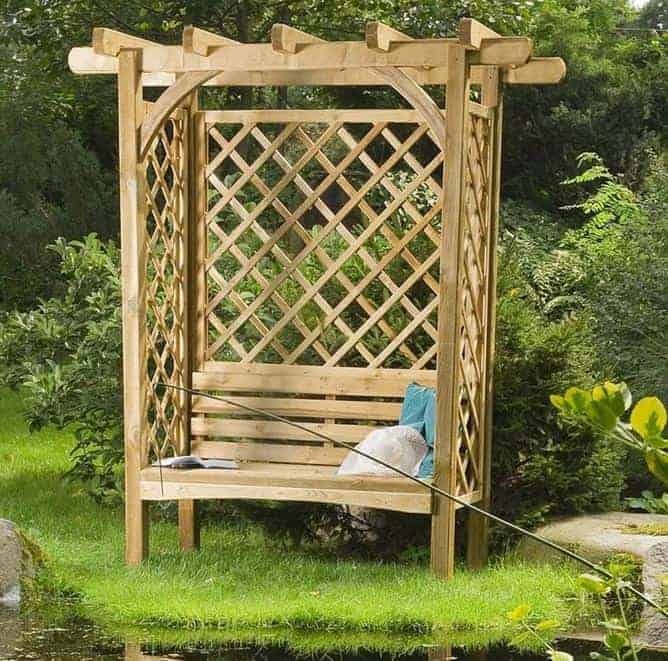 The Jagram York Garden Arbour is constructed from Northern European Redwood and provides a multi-purpose feature for your garden. Both a seating area for two and a trellis to grow and trail plants, this stylish piece would be a great addition to gardens of all sizes. The York Garden Arbour is an elegant seating area (2 seater) which will effortlessly add style to your garden or outdoor space. With a comfortable bench, flat roof and trellis panels it makes a remarkable feature and the diamond shape trellis lends itself well to trailing plants such as ivy or honeysuckle. It is constructed from pressure treated Redwood which will last for years. 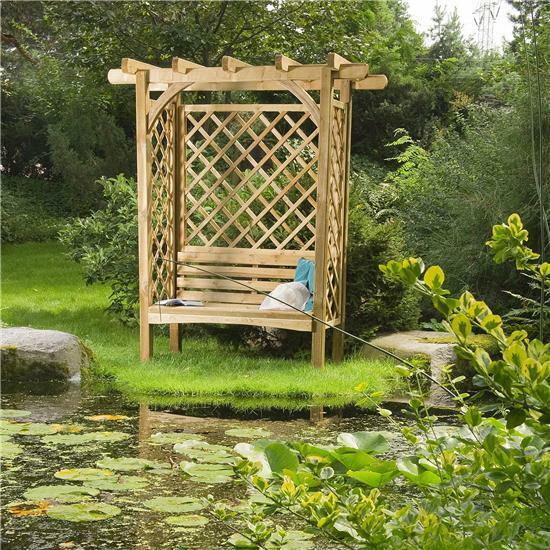 Kick back, relax and admire the beauty of your garden from the York Arbour which is an affordable price too! 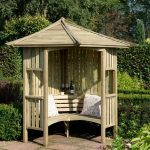 Made from pressure treated Northern European redwood, the Jagram York garden arbour gives a stunning natural effect in an effort to blend into the backdrop of your garden. 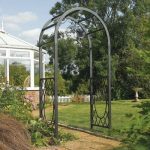 Whether as a centrepiece or as a secondary decorative piece, the York garden arbour will make a fantastic addition to your garden. Sit and admire the view whilst enjoying special times and long chats with friends and family. 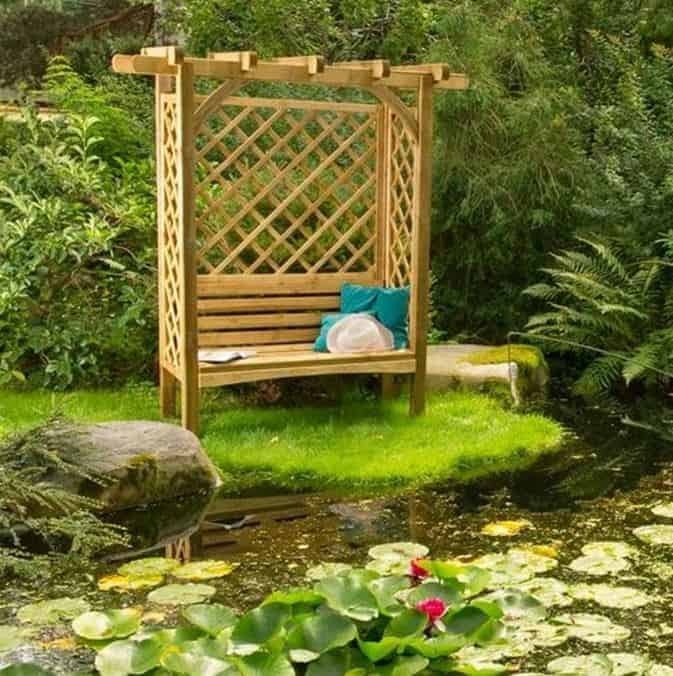 With flowers growing up the trellis it will feel like a secret hideaway seat within your garden. A garden arbour may be just one option of garden seating and decorative items that you may be considering purchasing for your garden. In order to help you make an informed purchase decision, in this section we look at the benefits of having a garden arbour as oppose to a traditional seating arrangement and discuss the many features it offers. Seat: The seating area provides adequate seating for two people, on which a fitted cushion could be added for extra comfort. The slatted seat is constructed from the same pressure treated redwood timber as the rest of the structure which makes it ideal for an understated addition to your garden. Trellis: The trellis surrounds the seating area on three diamond latticed sides as well as an overhanging area with the potential to trail plants over as well. By trailing suitable plants along all the sides of the structure you will create a seating area that is both visually attractive as well as being a cosy hideaway in which to sit and enjoy the garden. 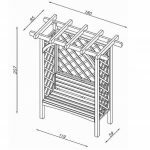 Jagram York Garden Arbour: How easy to build? Due to the smaller dimensions of the York Garden Arbour, it is possible that an individual could assemble the product alone, however for a fast and safe assembly the manufacturer recommends that assembly is a two person job. 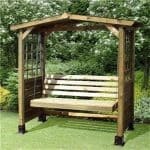 The garden arbour will arrive flat-packed and the package will contain all of the timber parts, fixtures and fittings required for an easy assembly. We expect that this product could be easily assembled within a few hours, even by a novice DIYer. Clear and easy instructions are provided in a step by step guide, available in a range of languages. 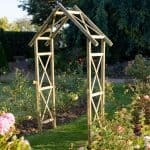 Jagram York Garden Arbour: What is the overall quality like? Jagram designs and manufactures a range of attractive garden items, from fencing to garden buildings. 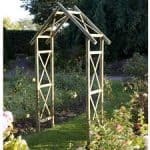 The Jagram York garden arbour can be used on its own as a seating area and decorative feature or additionally to show off beautiful trailing plants on its trellis. The European redwood timber the arbour is constructed from is used due to its strength, durability and low maintenance properties. 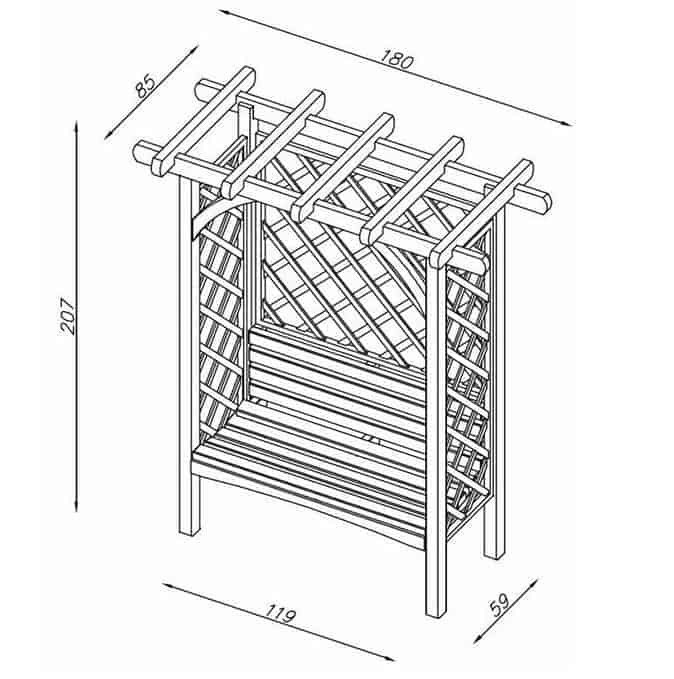 The garden arbour is a product that could be placed in the corner or as the central feature of a garden. The structure is protected against damp and rot and will look great in your garden for many years to come. The Jagram York Garden Arbour would be ideal for any size of garden, ranging from being the centrepiece of a small garden to being an additional piece and seating area in a larger one. The pre-treated European Redwood gives the arbour a natural appearance that will fit into your garden effortlessly. 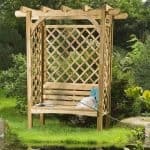 At this lower price point the York garden arbour is a budget friendly and accessible piece for any garden. My 13 year old is obsessed with The Secret Garden and since I’d do anything to get her out of her bedroom, I’m trying to create a quaint, rustic “secret garden” of her own so she can spend more time outdoors. 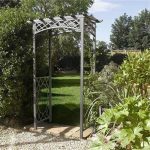 I’d been searching online for garden accessories when the Jagram Sa York Garden Arbour caught my eye. It’s absolutely perfect and even more breathtaking in real life. My garden has just transformed, and my daughter adores the structure. The crisscrossing trellis creates absolutely stunning effects with light and shadow, and by draping a few vines and flowers over it, we’ve turned the arbour into a gorgeous vintage-looking piece. I’d definitely recommend this to anyone looking for a strong, affordable, and beautiful design; or if you’re a mom who just wants to see her kids away from the blasted internet.